It was night and we were driving into one of the world’s oldest dune fields. We were heading towards Sossusvlei, so we could climb a dune and watch the sun rise. But it felt like we had left Earth behind and driven straight into a landscape from some alien planet. We were the only vehicle on the dark road; mysterious, undulating shapes of endless dunes surrounded us; on both sides long, eerie fingers of sand reached out to catch hold of us; and straight ahead was an impossibly huge moon, apparently setting directly onto the road. It was beautiful, amazing and unsettling all at the same time. I would not have been surprised if an alien space-craft had suddenly appeared and cruised alongside us. I wouldn’t have been surprised if we started spotting 8 foot long ants or gigantic monster lizards. It was that kind of night. Utterly amazing. A little scary. And yet we drove on, straight towards the orb of the moon. And didn’t take a single photo!!! After negotiating a maze of sandy tracks, we arrived at our destination, and start climbing up the ridge in the cold of pre-dawn. When we got to a plateau we stopped, but I was shivering so much I couldn’t sketch. The first warm rays of the sun were very welcome, but I didn’t really warm up until I ran down the steep side of the dune and finished a cup of hot tea! 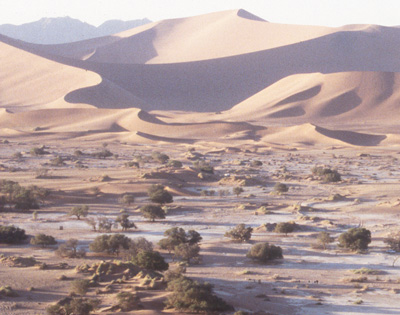 Sossusvlei, Namibia, is in the Namib-Naukluft Park. It is approximately halfway between the coastal towns of Lüderitz and Walvis Bay, which on the map are about 400kms apart. But there are no direct roads between these towns thanks to the dune fields of the Namib Desert, so the average driving distance is more like 800km, as you skirt inland. Half way along, you take a turn west and find Sesriem (where you can camp). Sossusvlei is the deepest area in the dunes that you can drive to. Directly west from there the dunes stretch another 50kms to the cold breakers of the Atlantic Ocean. The only way to see this piece of coast is by boat or by plane. If you want to go to a place where the landscape makes you feel truly tiny and insignificant, you won’t find many places that rank alongside Namibia! Until next time… . . . . This entry was posted in #WishIHadAPhotoWednesday, Blog Posts and tagged #WishIHadAPhotoWednesday, Namibia, sossusvlei on August 19, 2015 by Alison.